Birthdays, Weddings, Bar/Bat mitzvah celebrations, Hens nights, Children’s parties…. and more! Planned or a surprise for your guests, a drumming workshop or performance is a great way to make sure you have a really memorable celebration. We have 3 types of sessions that we recommend for celebrations. All are family friendly, and suitable for all ages. Hands-on drumming session (1hr, up to 50): everyone gets and drum we and run a wholly inclusive, joy-filled session to entertain and uplift. Interactive performance (variable duration for any number of guests): we drum and sing and engage event guests as they please. Some drum with us and others enjoy our rhythms and hopefully get their dancing shoes on! 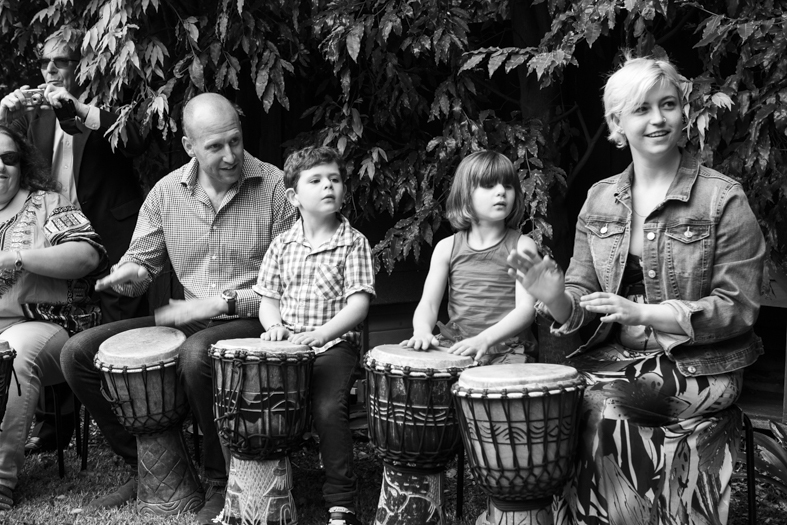 Drum circle (variable duration for any number of guests): we create a circle of drums/percussion and people come and go and join the fun fun as they please. Others watch and enjoy the rhythms we make! This is the most cost-efficient and flexible style of entertainment option we provide. Contact us to discuss what is most suitable for your event or celebration.